Fate Testarossa is a magical girl who’s only desire is to please her mother. She soon meets another magical girl named Nanoha Takamachi, and it takes a while for them to become friends. 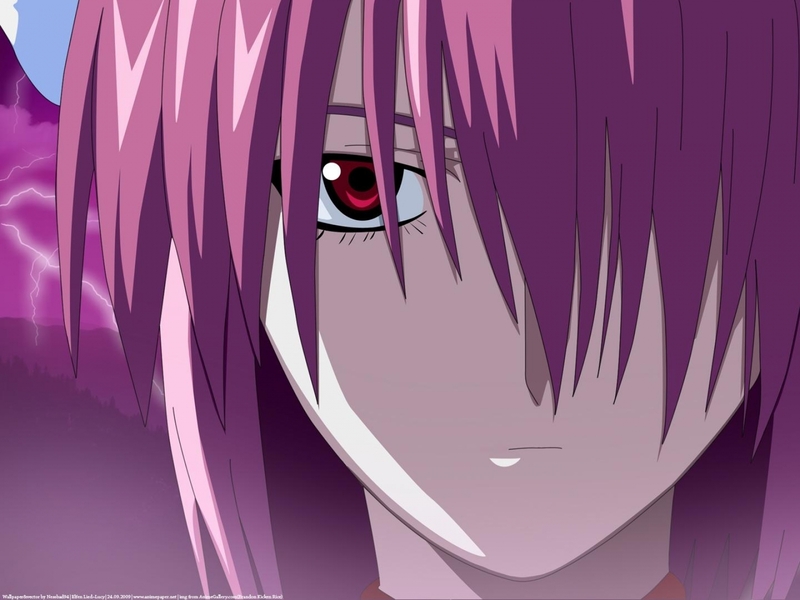 Eventually she learns her mother is evil, and she starts working with Nanoha to protect Earth. 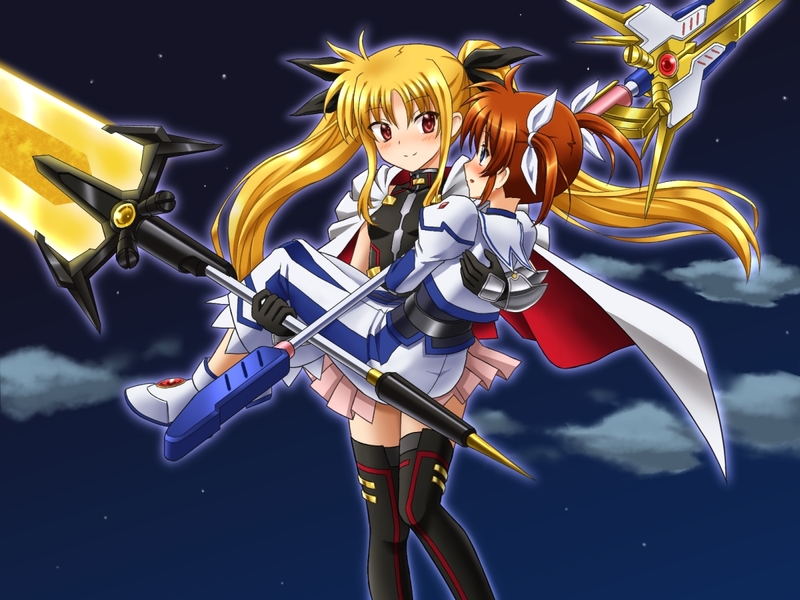 In Magical Girl Lyrical Nanoha, (MGLN) and Magical Girl Lyrical Nanoha A’s, Fate is probably nine years old. Because Fate is a clone of her sister, Alisa, she has no definite birthday. In MGLN, Fate is seen mostly in her magical girl outfit. This outfit consists of a tight black spandex-looking suit with a long flowing cape. Her main weapon is a scythe, and she usually wears her hair in twin-tails being held by black ribbons. 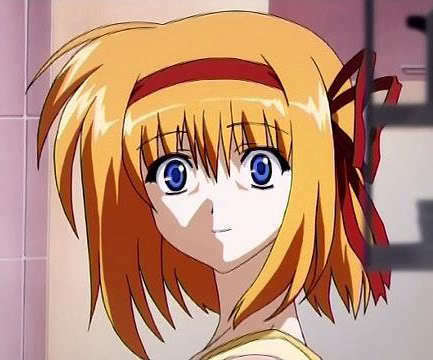 In the second season, MGLN A’s, Fate dresses in casual clothes in which her twin-tails are usually help up by pink ribbons, given to her by Nanoha in season one. Her outfit is mostly the same for magical girl form. In Magical Girl Lyrical Nanoha StrikerS, Fate is between the ages of fifteen and twenty. As an adult she usually has her hair in a really low pony tail. Because she works at the Time-Space Administration Bureau, she is usually in a black suit with a black skirt. Her magical girl uniform is about the same as when she was nine. The most noticeable change is her cape changes from black to white. Fate is a gentle sweet girl that wants to be loved. As a child, Fate was constantly abused by her mother. She cares a lot for her friends, and will do anything to protect them. She always wants to do her best, but she still is affected by her past. 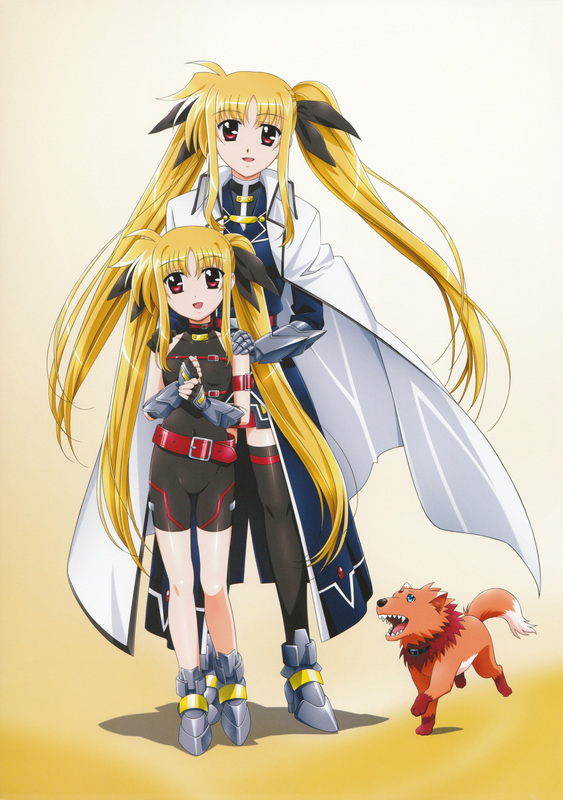 When Nanoha adopts Vivio, Fate helps Nanoha raise her. Fate has had a rough past, but she doesn’t let that have a negative affect on her personality and character. I love Nana Mizuki as an actress, she is on of my top favorites. The only problem I had with Fate’s character was her voice was a bit to gentle and soft. I personally think that the voice should have been a bit louder to bring out more of Fate’s cool factor. Besides that, Nana Mizuki did a great job. 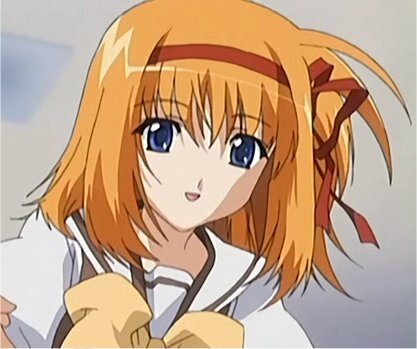 I love Fate Testerosa character, and I can’t wait to see a bit more of her in the Magical Lyrical Girl Nanoha ViVid series. Fate’s character is so cool, but she is also gentle. I really like how loyal and protective she can be over her friends and family. Homura Akemi from Makoda Magica. Homura Akemi is a new transfer student at Madoka Kaname’s middle school. She seems like a quiet and cool girl who doesn’t socialize much. She seems to only be concerned about Madoka, and constantly tries to stop her from becoming a magical girl. Rating Appearance: 10/10 Homura Akemi has long back hair that seems to split into two parts halfway down her back. She normally doesn’t show any emotions. The color she is associated with is purple. This is probably because of her eyes that her magical girl costume is purple too. In the first original timeline, Homura had her hair split into two braids. She wore glasses, and she looked really innocent. The change between the first timeline and the final one really brings out Homura’s character as a whole. Personality: 10/10 Homura is always thinking about Madoka. Everything she does revolves around saving Madoka from becoming a magical girl. This proves to be a larger feat that Homura had originally expected. Homura started out as a quiet unathletic girl and slowly becomes cool and athletic over time. Madoka helps Homura feel important and that is why Homura feels so attached to Madoka. In the end, Homura’s feelings are so strong to remember that Madoka after she becomes a theory. In the rebellion movie, Homura becomes a “devil” to bring back Madoka’s human form. I loved this twist in the rebellion movie. How well the character’s CV fits the character: 10/10 The actress did a great job at playing Homura. She did a great job in voicing quiet Homura then cool unemotional Homura. All the different Homura’s in the anime were well played with different voices. The English and Japanese voice actresses did a great job, but I still feel a bit more biased towards the Japanese actress because I saw her first. Overall Thoughts: 30/30 Homura Akemi is my favorite character in the Madoka series. I love how her character changes in the eyes of the viewers over the course of the series. At the beginning, Homura seems like a cold unemotional creep who is getting in the way of Madoka becoming a magical girl. 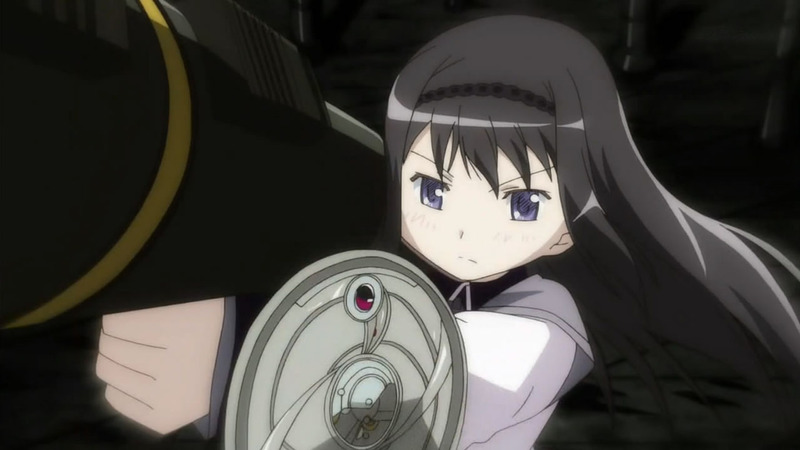 Eventually, the audience realizes that Homura is actually stopping Madoka from making a major mistake. In the end, Madoka does become a magical girl to save the world, and all of Homura’s efforts to waste, kind of. The directors of this series definitely didn’t hold back on the subtext between these two. The naked cosmic hug was great, but I wouldn’t have minded having more Madoka x Homura scenes. The devil twist at the end of movie 3 “Rebellion” made made my life though. Karen is a sweet and kind character who happens to have a crush on the school’s biggest player, Imadori. She spends most of her time wrestling, so she is super strong. 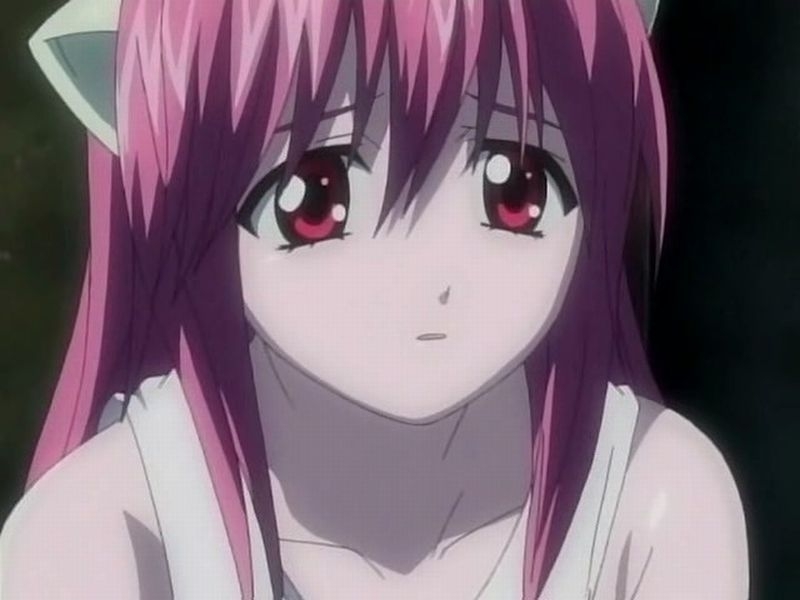 She doesn’t always know her own strength, but she is definatly the strongest character in the entire anime. Karen has short green colored hair. She seems to be average in size. Karen’s character is often put into the background of scenes and her character isn’t suppose to have much present. 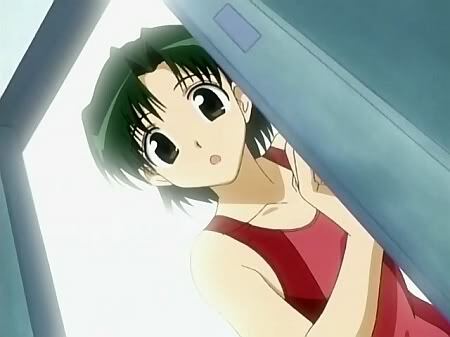 After the summer break in season of one of School Rumble, Karen dresses more feminine. She braids a bit of her hair, adds some eyeliner, and puts on a bit of lipstick. Karen seems to lack a bit in common sense because she focuses so hard on wrestling. She has a soft and gentle personality, which usually makes it hard for others to be angry at her. Karen is a bit stubborn and sometimes shows anger through acts of strength, but she usually doesn’t notice she is doing it. Karen doesn’t like being called strong, and she is usually self-conscious of her ability. I think the voice actresses did a great job for voicing Karen. They were able to bring out her sweet and gentle side of Karen’s character. The soft voice worked well to contrast with the massive amounts of strength Karen would use. 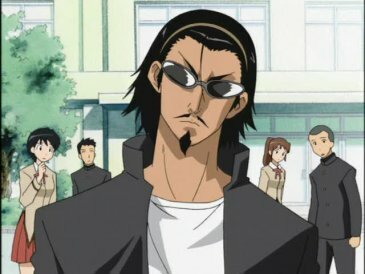 Karen is a fun side character that they added to School Rumble. It is nice to see a female character that is actually stronger than the strongest guys in the anime. Karen definitely is not one of the more memorable characters in School Rumble, but she definitely adds to the anime in humorous ways. I totally support the Karen x Imadori ship. I think they are great together. 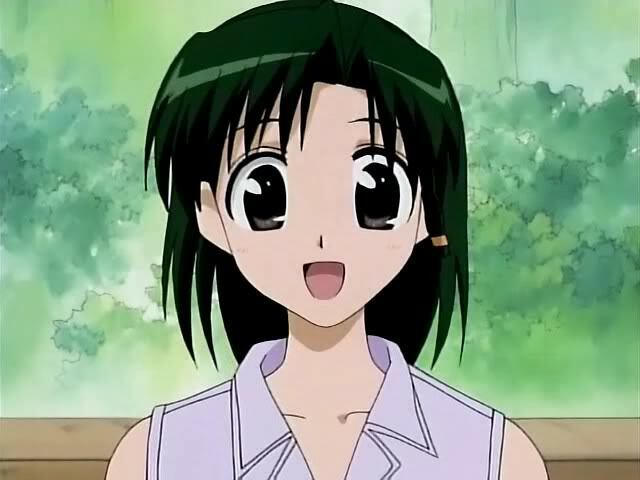 Karen was a fun contrasting character that helped the producers keep up the humor in School Rumble. 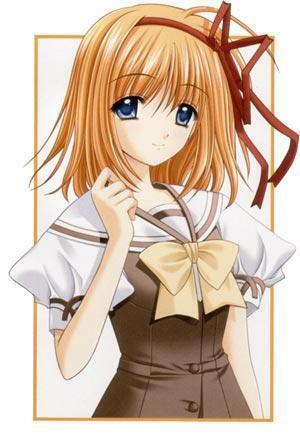 Kaede is the main character (Rin Tsuchimi)’s childhood friend. The two live together and Kaede dedicates her life to making Rin’s life a dream. She spends her days doing housework and cooking for him and generally being the perfect wife for her friend. She cares very deeply for Rin and even lashes out physically if she believes something may be worming its way between them. Kaede’s face is fairly ordinary with no defining features. Her shoulder-length red hair is held back by a deep red bow. Be this as it may, she is still very cute and looks great in whatever she wears. Kaede is usually very soft spoken and only wants whatever Rin wants and whatever is good for Rin. Be that as it may, she turns into a (I can’t use the word demon because demons are a thing in Shuffle!, so just pretend I used a synonymous word). It becomes apparent that Kaede is the Yandere of Yandere’s because she feels she must atone for her sins against Rin. When the two were young, Rin’s parents and Kaede’s mother went on a trip together and left the Rin at Kaede’s house with Kaede’s father. When Rin begged them to come home early, their parents died on the return trip. Or so Kaede believed. She ripped Rin’s life apart, blaming him for the death of her mother. When she found out that they had actually attempted to come home early because Kaede had contracted a horrible illness she felt immediate regret and dedicated her life to serving Rin to make up for the emotional and physical pain she had caused him. You can see the yandere. It’s in the eyes. Yuko Goto does a fantastic job of shifting between an innocent, childlike tone when Kaede is calm to a crazed, psychotic shout. She is a fantastic voice actress that dynamically holds Kaede’s feelings on her sleeve. At least when they need to be. Shifting from a child to a ravenous (same word you thought of in place of demon, here) is an art, and I would say that Yuko Goto has a knack for it. Kaede may be a crazy psychopath, but I still like her all the same. 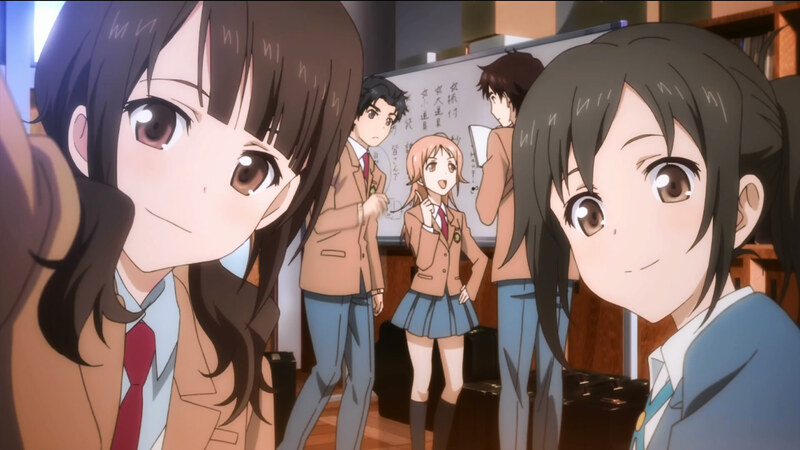 Watching this anime, start to finish I ship Kaede with Rin. Sawa Okita is an average high school girl who has a dream of become a professional jockey. 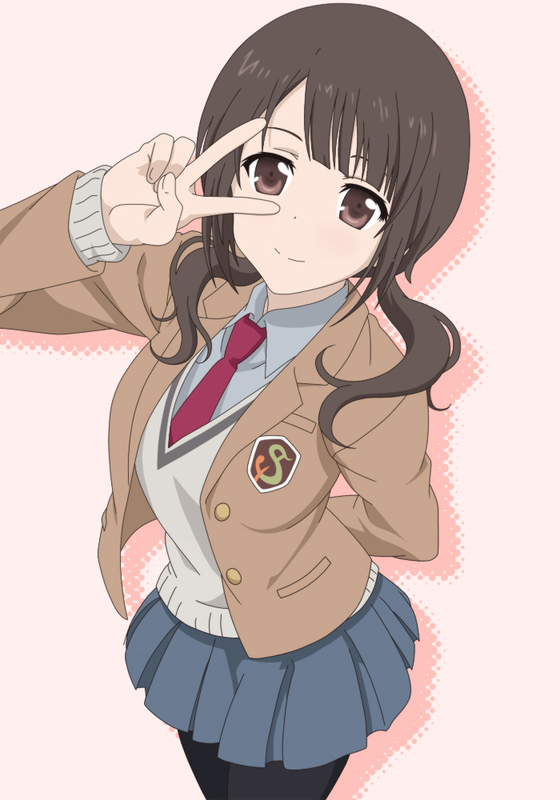 She is best friends with Konatsu Miyamoto, and she helps Konatsu start a new choir club. Sawa has brown hair that is always pulled back in two pigtails. She has a great body, and she is a bit taller than most girls her age. Sawa has great style and always looks nice. Sawa is a peppy character who easily gets along with others. She is good at helping people who are down or sad. It is fun to watch Sawa tease her friends. She often makes fun of Konatsu in a loving way. Sawa is driven by her dream to become a professional jockey. She goes against her parent’s wishes and tried to enter jockey school on her own, but she is turned away because of her height. Sawa has a hard time telling others that something is bothering her. She mostly keeps to herself when she is sad. Sawa is a fun and driven character. She also likes to help her friends when they need it. Sawa will stride towards her goals no matter how difficult they are. I thought Saori Hayami was a great choice in voice acting for Sawa. She was great at bringing out Sawa’s character. Saori had a great voice for all the songs, a fun voice for Sawa’s teasing side, and a more serious tone when Sawa was going through rough times. Saori did a great job of helping Sawa become one of my favorite characters. Sawa Okita is my favorite character from the Tari Tari anime. I loved the beginning when she helped Konatsu build her club. She always seemed to be having fun. I enjoyed the scenes when Sawa helps cheer up her friends, but it was rough watching her struggle about her future on her own. I loved Sawa’s voice. She had a great singing voice. My favorite part about Sawa is her drive to achiever her dream. She tries really hard to get into the riding school in Japan, but is sadly turned down. I was really happy she was able to find a school that accepted her, but it’s in America. I’m impressed she is willing to go to a new country just to achieve her dream. Kotomi is a girl-genius that spends her free time reading advanced scientific texts and cutting out random snippits from them to keep. She is very shy and hyperaware of everyone that could be a bully, often asking new faces “Are you a bully?”. 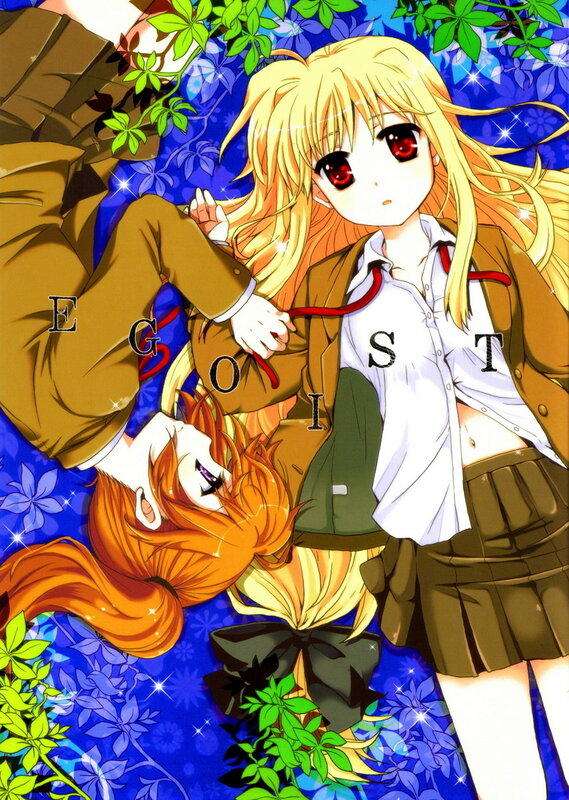 She has an attachment to Tomoya Okazaki but slowly learns that the rest of the cast are by her side as well. Kotomi’s beautiful and long purple hair flows down her back, with a small portion held up on the sides by decorative hairpieces she has had since she was a child. She usually has a faraway look in her deep purple eyes when she is not actively socializing that is reminiscent of her higher intelligence. When playing the violin she moves gracefully and her eyes close, instantly softening her face. Kotomi is always a cute little girl trapped in a high school senior’s body. Kotomi is shy and fearful of those people around her she is unfamiliar with, though once she warms up to someone they realize she’s just a big kid, having never had a real childhood of her own. She has spent years in service to her own demons after a traumatic childhood experience involving her parents’ death. All that being so, the real kicker for Kotomi’s personality is her platonic affection for Tomoya, her first friend. After Kotomi’s parents died on her birthday and Tomoya never showed up to spend it with her, she shut the world away and Tomoya with it. Years later when they reconnected in high school, she realized immediately that Tomoya had no memory of her. 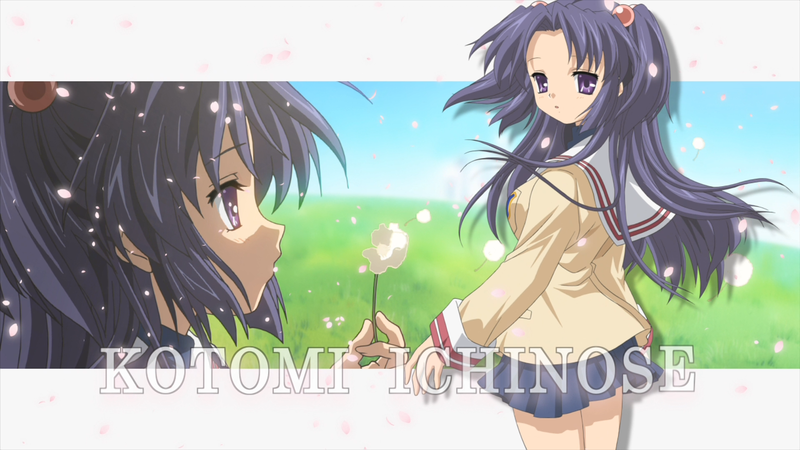 Rather than trying to rekindle their old friendship, Kotomi simply dropped a few hints to see how deeply his memory was affected then started all over with Tomoya as though they had never met. She put Tomoya before herself, effectively giving him the chance to leave and never return, because she cared about him more deeply than any living being despite the years that had pulled them apart. It pains me to dock points from Kotomi for any reason, and I would be more than willing to give her full points, except that Kotomi as a child appears in some memory sequences. Emily Neves does a fantastic job of exemplifying Kotomi’s innocence and her subdued emotions. Even when Kotomi has her breakdown and is overcome with a flood of painful emotion, My only issue with the voice acting is young Kotomi. During the flashback scenes, Emily Neves does not do a very great job of altering her voice to account for Kotomi being a child. The voice is exactly the same, and though it still fits, it is a little disconcerting to hear a 5 year old sound like a high schooler. 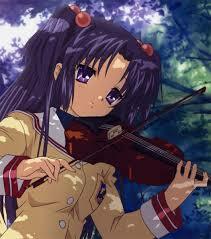 I may be biased towards Kotomi Ichinose, as she is my favorite character in Clannad. (Ushio takes over in After Story, but I’ll save that review for another day). That being said, I tried to look at Kotomi’s charcter from an unbiased viewpoint. 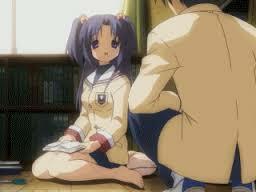 Every time I watch Clannad, I get excited about seeing Kotomi’s cuteness blend perfectly with her innocence and social isolation. Characters that can compete with Kotomi are few and far between. 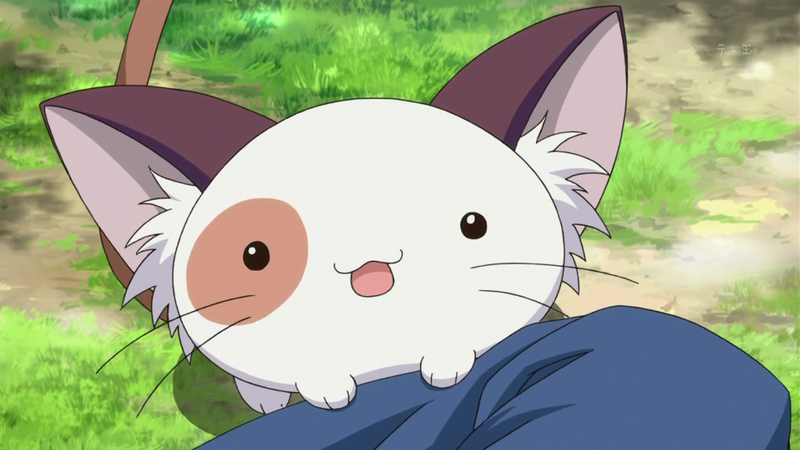 Paanya a cute round cat-like creature that lives on the campus of Yuihime Girl’s Academy. She is taken care of the most by Miu Amaha. She is like the campus mascott, and her presence makes the anime cuter. Paanya is an adorable ball of fluff. There is never a time she isn’t adorable. Not even when she is angry. I liked how they made Paanya act like a wild animal. Paanya lives at the school, so she doesn’t have an owner. She isn’t tamed, so when she needs to protect herself she does. The best part able Paanya’s character is she acts like a stray cat and isn’t automatically tamed. Nothing really special about the voice actress that plays Paanya. She didn’t do a bad job, but she didn’t do exceptionally well either. I mean, all she was doing was making cute cat noises. The voice actress well for the role, but it wasn’t anything special. I loved Paanya because she was adorable. She helped the story move along too by leading characters places. She probably ended up being my favorite part about the anime because the plot upset me so much. 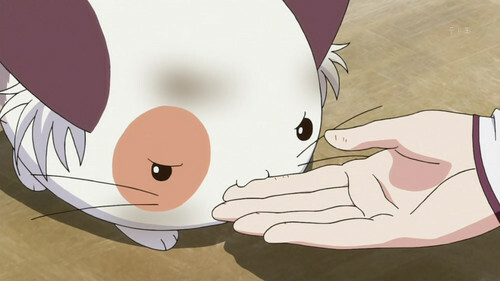 Paanya was the best part of the anime Mashiro-iro Symphony in my opinion. These are characterized dangos. Happy dango is on the left and Angry dango is on the right. 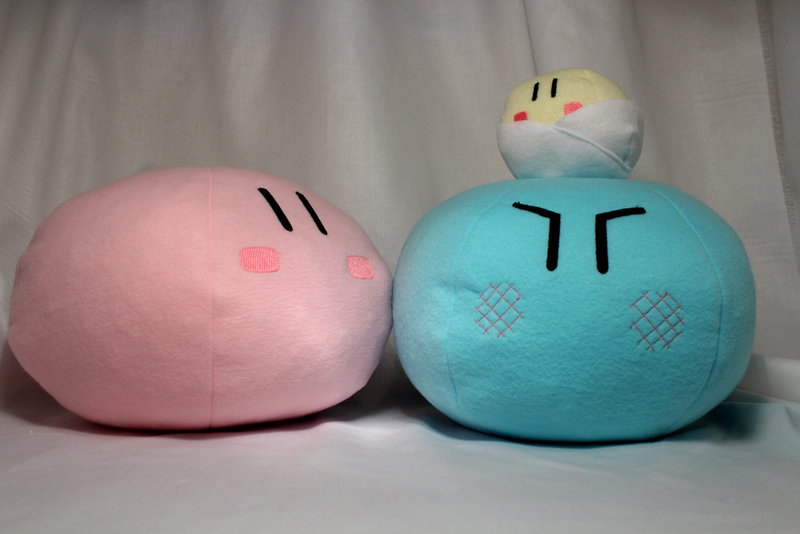 The dango is the mascot character for the anime Clannad. The main character Nagisa Furukawa loves the “Big Dango Family” song and drawing dangos. The dangos do not have any speaking role in the anime, but the “Big Dango Family” song is the ending theme song for the anime. The appearance of the dango is cute and adorable. Sometimes the dangos are characterized, but most of the time they are just drawn simply. Because of the abundance of simply drawn dangos on a single page is so large, it takes away from the appeal of dangos at times. 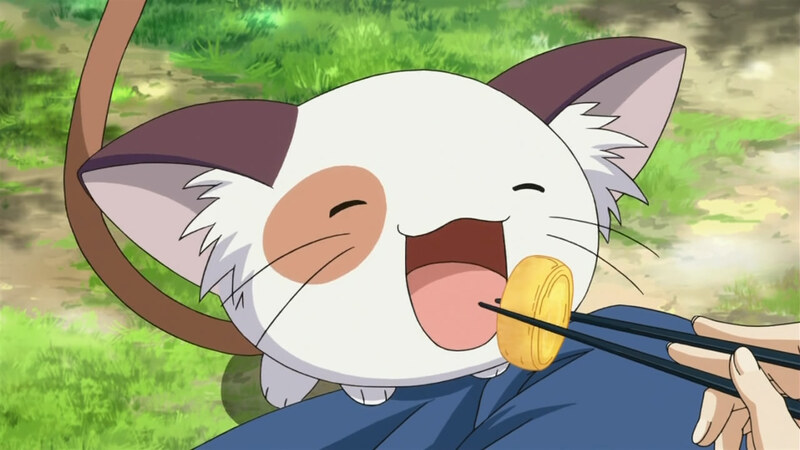 Dangos are one of the cutest anime mascots I’ve ever seen. They don’t have to say much to be adorable. Aesm has bought himself a set of dangos. He has an angry dango, happy dango, and baby dango. Every dango is soft and great to cuddle with. 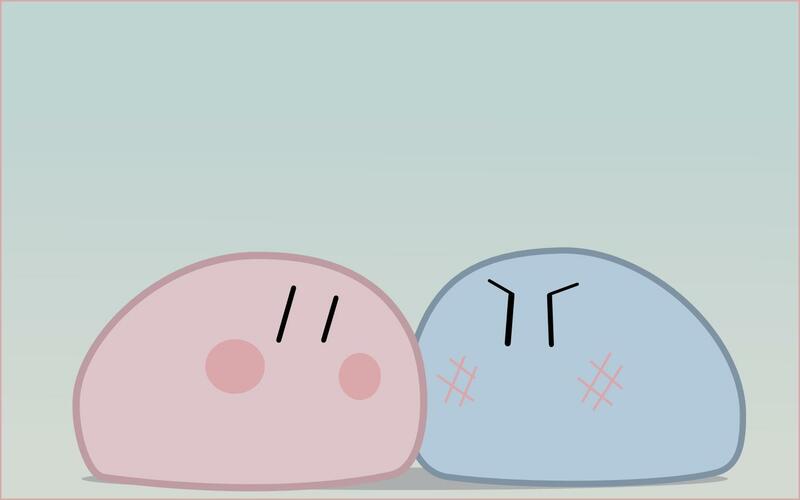 Happy dango is pink, Angry dango is blue, and baby dango is the small one. This is a photo from online found on DeviantArt.